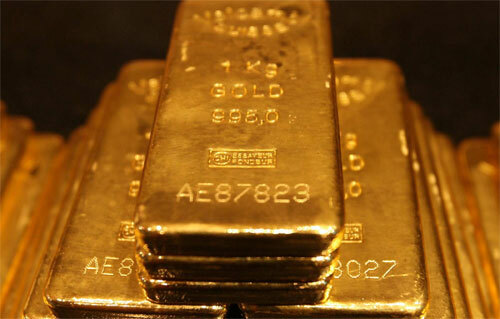 LONDON — Gold took a spill overnight, and set off the usual guessing game about what caused the move. Having closed around $1,134 an ounce on Friday, gold dropped to a five-year low below $1,100 minutes after Chinese markets opened (it’s since recovered about half the distance). The truth about such moves is you very rarely know what caused them, especially not in real time. Still, it’s fun to speculate. So let’s. A possible catalyst, according to one story on the wires, is Friday’s announcement by China’s central bank that it holds 1,658 tons of gold. This is up from the 1,054 tons it had in April 2009, the last time China announced its holdings, but way below what some pundits were expecting. I must say I’m struggling a bit with the logic of this one. I’m not sure how China having less gold than some people thought (assuming we should believe them) is bearish for the metal. If anything, it could be bullish – China may buy more. From what I can glean, the thesis is that China’s been amassing gold with a view to launching some kind of gold-back currency to challenge the dollar. Now that China says it has less gold than some people thought, the prospects for such a currency have diminished, or so that argument seems to go. Hence less Chinese gold is bullish for the dollar, and thus bearish for the yellow metal. Confused? I know I am. It’s a weak argument in my view. Besides, we should be wary of giving much weight to the official figure. “China still has far more gold than it admits,” says Jim Rickards in his latest update for Strategic Intelligence members. As Jim’s noted to me before, China can hold gold with the State Administration of Foreign Exchange and the China Investment Corporation, meaning it doesn’t get reported as part of official central bank reserves. It can then move some of that gold to the central bank, the People’s Bank of China, as and when it wants to report a higher figure. There’s another “explanation” for gold’s move bouncing around the newswires today. Gold fell, says this theory, because of the impending rise in US interest rates. There are those that believe Federal Reserve chair Janet Yellen will announce a hike in the target fed funds rate at September’s Federal Open Market Committee meeting. Fed watchers will know the market was previously looking for this to happen in June this year… and before that in March. No one should (or likely will) be surprised if talk of a September hike is soon replaced by talk of it happening in December instead, or even next year. So I’m not convinced by this explanation for gold’s move either. Besides, why today? The market’s been wittering about a possible September rate hike for weeks. Here’s an intriguing thought courtesy of Mr. Rickards, who’s been closely watching China’s effort to get its currency into the special drawing rights basket. Issued to central banks by the International Monetary Fund, the SDR is a composite of major currencies and acts as a sort of supranational money. China wants the yuan in the SDR because it wants to play a bigger role in the world’s elite financial institutions, such as the IMF. To do this, it has to “play be the rules of the club”, as Jim puts it. Being transparent (or at least saying you are) about your gold holdings is one of those rules. China faces a slowdown in economic growth. China has also pegged its currency to the dollar. Traditionally, one way China might have looked to stimulate its economy is by devaluing the yuan, in the hope of boosting exports. But that’s not an option right now. A competitive devaluation would not be “playing by the rules of the club”. So China must maintain the dollar peg at its current level. Now, when you peg to another country’s currency, you effectively outsource your monetary policy to that country’s central bank. In other words, interest rates in China are heavily influenced by what the Fed. Right now, a Fed rate hike would be bad news for Chinese policymakers trying to prop up slowing growth. Another point to consider: Chinese president Xi Jinping makes his first state visit to Washington this September. Will the Fed really choose the same moment to raise interest rates, knowing it would hurt the Chinese economy? for The Daily Reckoning, U.K.
An economist by training, Ben takes an analytical, evidence-based approach to the markets. His views have been published by respected national and international publications, including Bloomberg, The Telegraph, MarketWatch, Business Insider and International Business Times. Ben previously edited investment newsletter the Fleet Street Letter, and has also worked at online gold and silver exchange BullionVault, where he created their Gold Investor Index, a gauge of private investor sentiment that has been cited by Reuters, Bloomberg, the Economist and CNBC among others. Ben studied economics at the University of Cambridge and also holds a master’s degree in financial economics from the University of London.